Roy Helser, a man who pitched with distinction for the Portland Beavers for more than a decade half a century ago, then later made a name for him­self as a coach at his alma mater, Lin­field College in McMinnville, Oregon. The Helser family emigrated to the United States from Norka, Russia and settled in Portland where Roy was born. Helser graduated from Benson High School. Ironically, he did not play high school sports but found his niche in baseball under Coach Henry Lever. Helser's pro baseball career started at Waterloo, Iowa, in 1937. Later, he pitched for the Salem Senators of the Northwest League in 1940 and 1941, and then signed with the San Francisco Seals of the Pacific Coast League in 1942. Late that season, he was acquired by the Portland Beavers. At first, it was part time. Helser also pitched for a team in the Albina Shipyards League in 1943, before settling in as one of the Beavers’ top pitchers for the next several years. He had three consecutive 20-win seasons, going 20-16, 20-14 and 20-16 from 1944 to 1946. Helser played on the 1945 Pacific Coast League pennant winning team. It was an era when the Beavers played in old Vaughn Street ballpark and rode a wave of popularity that saw them draw nearly half a million fans 1947. 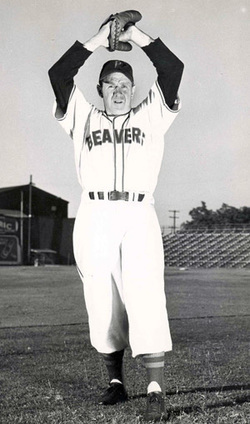 Helser also made a mark as a semi-pro player and manager in a time when that carried considerable weight, first with the Silverton Red Sox, then with the Drain Black Sox where he won three consecutive Southwestern Oregon League baseball championship in 1952, 1953 and 1954. Later, Helser coached at Linfield College for 21 years, winning over 60 percent of his games (wins 322, losses 195, Ties 6). Helser's teams won 14 Northwest Conference championships and a National Association of Intercollegiate Athletics (NAIA) championship in 1966. After coaching, Helser served as Athletic Director at the school for four years before retiring in 1972. The baseball field at Linfield was dedicated to Helser in 1973 and later a new stadium was named in his honor. “He was one of the greatest competitors that I have ever known,” said Ad Rutschman, former football coach and athletic director at Linfield who played both baseball and basketball for Helser at the school. Roy Helser was inducted into the Oregon Sports Hall of Fame in 1981 and the Linfield College Sports Hall of Fame in 1998. Helser died at his McMinnville, Oregon on October 25, 1994.